Patterns come and go but florals stay forever. From art to fashion, William Morris to Elie Saab, from England to the Orient, florals have been one of the most prolific patterns the world has ever seen. Make a statement of yours by choosing a floral wallpaper which will bring the outside in, add a touch of class to your space and frame your furniture in the most beautiful way. In this dining room by April Russell (left), the rich burnt orange tones of the upholstered dining chairs are mirrored in the delicate blossoms of its painted wallpaper. The beauty of the design glows in the light of a traditional casement window whilst an equally delicate glass chandelier – placed in the centre of the room – finishes off the look for a scheme that’s nothing short of dining perfection. Louis Henri’s scheme of deep berry tones (below) contrasted with ivory drapes and upholstery is an effective combination and perfect for a master bedroom which isn’t at all saccharine. Blossom wallpapers provide limitless inspiration with their varying tones. Pick out a range of two or three complementary colours which can act as accents to your neutral space. Coordinate your cushions, photo frames and trinkets in these more saturated tones for added depth. Here’s a feature wall we can embrace wholeheartedly. 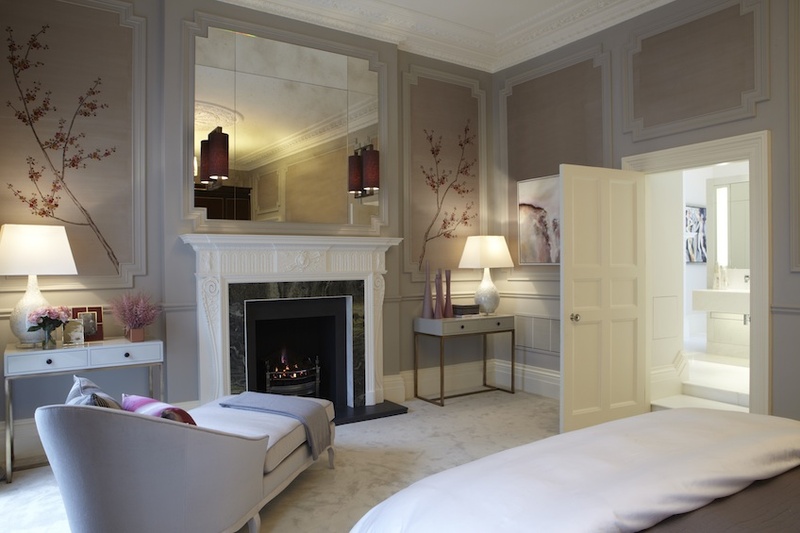 Sophie Paterson’s luxurious master bedroom (above) is expertly trimmed with De Gournay‘s delicate ‘Plum Blossom’ which makes a beautiful background for a shaped headboard. With the addition of a simple tasseled bedside cabinet key, the look is one of modern oriental. Making use of an oftentimes rarely maximised space, this blossom wallpaper adorns the wall panels of this pretty Helen Green Design bedroom, making a framed feature of the hand-embroidered design. The sprawling branches appear to be ascending from the elegant console tables meaning real flora can be kept to a minimum. 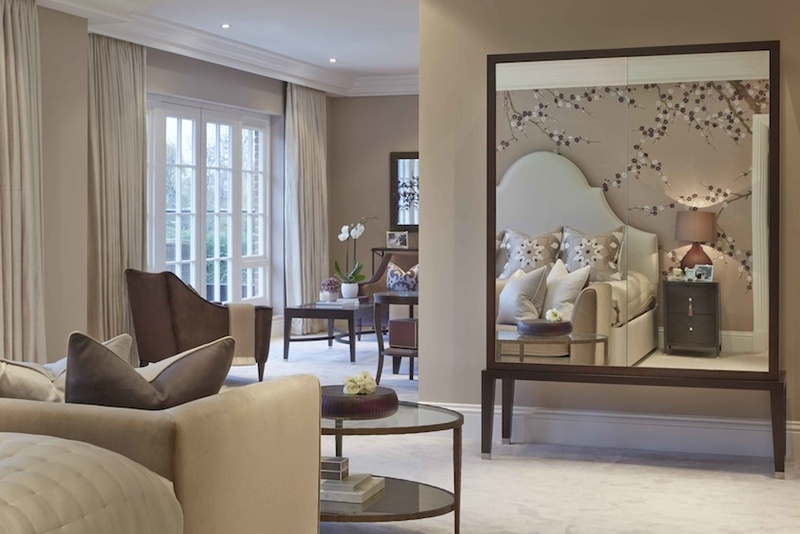 Fromental‘s ‘Sylvaner’ design in gunpowder creates an utterly sophisticated backdrop for a hallway when paired with a classical black and gold console table and Chinese-style mirror. 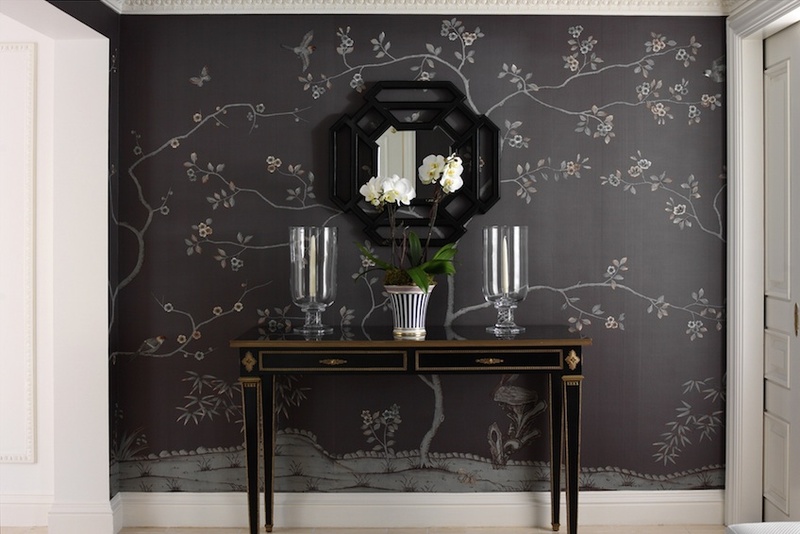 A simple white orchid is the perfect finishing touch to this chinoiserie space. Singlehandedly taking the look from traditional to thoroughly modern, from fresh to alluring, this Zephyr dining room proves that florals can be chic as well as pretty. A bronze background creates a rich canvas for pops of goldenrod yellow and peacock blue. Stylish wall lights, a chandelier dripping in glass icicles and sophisticated dining furniture offer a metropolitan aesthetic.